How did you all spend the holiday weekend? We were busy soaking in the sun. Friday was spent out in the ‘burbs at my parents’ pool with our best friend, 2 sisters, brother-in-law and 2 nieces. Then Saturday, we had friends come over to our place to spend time outside in the courtyard. It was such a beautiful day in the afternoon and so much fun to grill out with friends. I knew we would be waiting to eat a bit later in the day for other friends to join us, so I wanted to make a fun snack for people to be able to much on as we played lawn games. 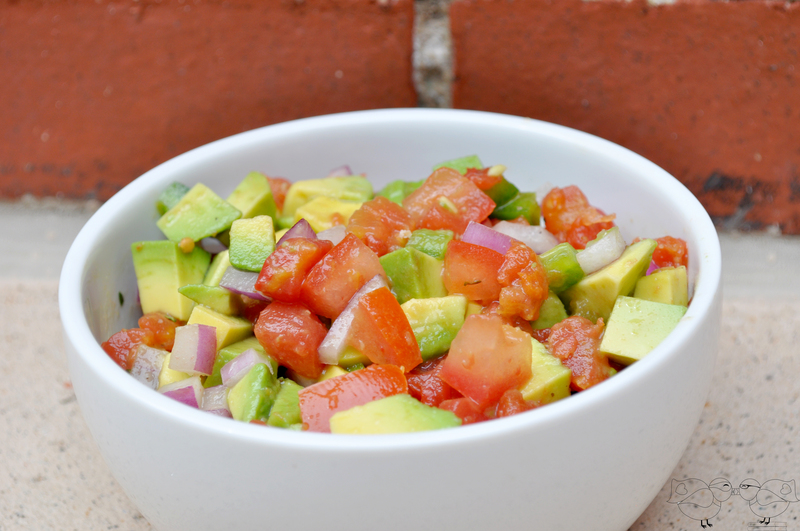 I had a great batch of avocados so I decided to make a Tomato and Avocado Salsa. Both my husband and our best friend tested the salsa throughout the prep process, and they said it kept getting better and better. My response – that is what happens when you let me finish adding the ingredients! 😉 It was truly the extra lime juice, cilantro, salt and pepper that brought the ingredients together. They are a needed final touch to make it go from okay to delicious! You can easily adjust how much kick or heat you like to your salsas. I decided to use both fresh tomato and a can of Rotel because I wanted the added chiles into the flavor. I also used 1 jalapeño with no seeds. If you like more kick, leave some seeds in the mix or use another jalapeño. While it takes a few minutes to get everything diced up - at least if you don't have a chopper like I don't - this is super easy to make. Add all the ingredients into a bowl and mix! I wanted to keep everything nice and fresh throughout the day, so I kept this Tomato and Avocado Salsa in a chiller bowl. If you haven’t seen one of these, they are my favorite kitchen tool! There is a gel inside the bowl that will freeze/chill and help you keep things cooler longer. It is best for outdoor summer parties or for potlucks where you are taking your dishes elsewhere. You can find them on Amazon here (FYI – this is an affiliate link): Fit & Fresh Chiller Serving Bowl with Lid They are so awesome!! To finish our weekend, because I know all of you were sitting on the edge of your seats about what I did Sunday (bahahaha), we spent the day outside AGAIN with books. I definitely got a little burnt. The upside? I am hoping it evened out some time lines for family pictures this coming weekend. I finished the book Gone Girl. Anyone else read it? The ending infuriated me. Hope you all had a fabulous holiday and weekend!! What yummy snacks did you enjoy this 4th of July? 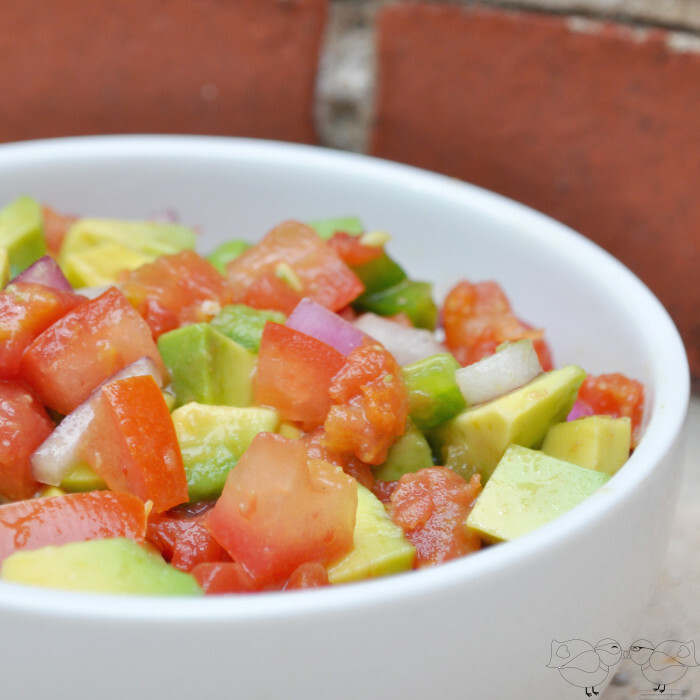 Love this tomato and avocado salad; perfect for summer and of course any time! yum- love a good salsa w/ some chips! Looks delish! I’m going to have to make this!! YUM!!!! I’m ready for some right now. While I dot eat onions I would love to try the salad with some olives yummy!! Oh my goodness, this looks divine. I want this for lunch now! Such pretty colors! OH yummy! That just looks soooooo fresh and summery! I need this at my next gathering for sure. I <3 avocados! I'm definitely trying this salsa! This looks like it would be a hit at a family gathering like a BBQ. Can’t wait to try your recipe! You got me at the word “fresh” and of course the Pinterestic pic. This looks great! Makes you feel a little less guilty too! This looks great! I’m going to try to make it. My husband and I love salsa. Great post, thanks for sharing. Fantastic and easy dish. Looks to be real tasty. That looks delicious! Living in Southern California, avocados are pretty much staples! That looks amazing! Avocado is a staple in our diet. We love it! 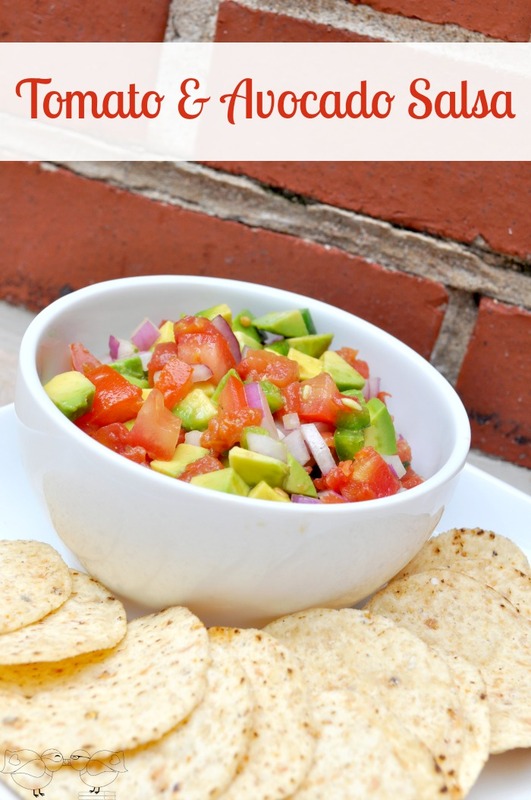 That sounds yummy, a cross between salsa and guacamole, both I love! That looks so fresh and easy. I love avocados! This looks delicious! All of my kids love avocado, but it’s still a work in progress on the tomato thing. This looks like the perfect refreshing snack for the Summer time. Love the flavor combos! This looks so fresh and delicious. Much better than the crappy jarred stuff I happen to be snacking on right now….thanks now mine tastes lousy looking at this, lol. This looks awesome…we love avocados here…we’ll definitely be trying it! That is something I think my husband would love! I would need to remove the onions for me though! This is one of my summer time favorite dishes. I just love avocados and this combination.